Each dental treatment room features incredibly comfortable Pelton & Crane Spirit 2000 Dental Chairs with ErgoSoothe™ chair technology that gently massages your back during your appointment. 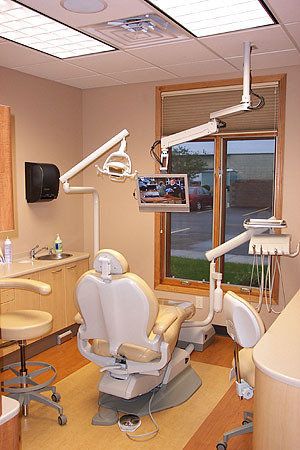 For your enjoyment, each dental treatment room has cable TV shown on two 19 inch LED monitors (one on the ceiling) so that you can see them while being treated. We also broadcast various programs on 5 additional channels for your enjoyment. You can listen to the TV using headsets if you prefer. In addition to watching TV, assorted presentations regarding your dental treatment will be shown to you as appropriate. This can include digital photos & x-rays of your teeth along with post-op instructions and presentations regarding specific treatment options.